Parker is like every other man in America and loves BBQ ribs. 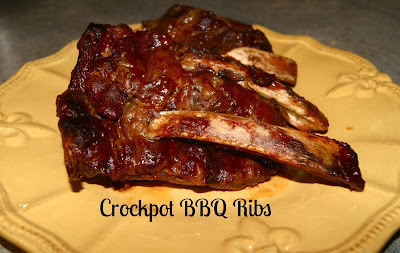 I didn't really have any experience cooking ribs, so I turned to my trusty crock pot for an easy out. All I can say is yum! This recipe passed the husband test with flying colors, and it couldn't be easier to prepare. 3 ingredients anyone? 1. Slice ribs into serving-size pieces and place into crockpot along with other ingredients. Cook on high for 1 hour. 2. Reduce heat setting to low and cook 8 more hours. Yep, it's that easy. These ribs are so tender and fall right off the bone. I highly recommend! Thanks for linking up today! This looks so easy!